Of the various problems associated with tooth decay, community behavior factors on oral and dental health have a significant role, because it is already known that the health status is strongly influenced by environmental factors, behavior, and health services. This includes the etiology of dental caries, the risks that cause dental caries, and the factors of population distribution, environment, and community behavior toward dental health. Because of this behavior factor to dental and oral health, several studies and surveys had been done to observe the behavior of a group of people to oral health. One of the maladaptive and nonfunctional behaviors in society is experienced by the user of narcotics and psychotropic drugs. In Indonesia, there is an increase in the number of drug users by 0.065% of the population of 200 million or equal to 130,000 people, and by 1998, it was estimated to reach 1%–2% of the population. In 2017, the National Narcotics Agency revealed 46,537 drug cases throughout Indonesia, with details of approximately 58,500 suspects. And until 2017, the total number of active drug users in Indonesia reached 6 million people. Drug abuse is seen in the presence of impairment in social, occupational, or school functions, inability to control themselves and stop the use of drugs, and which may cause withdrawal symptoms if drug use is discontinued. Such conditions are also called drug dependence, which is a compulsive-intensive condition of drug use to meet mental and psychological needs. Drug abuse creates damaging effect, such as family relationship, learning ability, behavioral changes, declining in work productivity, health problems, and many others. Based on the theory, the thought arises that with the changes in behavior in general, will affect the maintenance behavior of dental and oral health. In addition, almost all drugs work against the central nervous system that block the nervous system and inhibit saliva, water, and electrolytes secretion, especially those which are regulated by the parasympathetic system. The purpose of this study was to identify the description of caries and dental and oral hygiene of drug users in drug rehabilitation center through dental and oral hygiene inspection and caries severity measurement. This was a descriptive study with population of all patients in the Rehabilitation Center of Pondok Pesantren Inayah, Surabaya. The number of patients in this study was 60. This study was performed by measuring oral hygiene with oral hygiene index-S (OHI-S) and caries severity with decay-missing-filling index-T (DMF-T). A survey using a questionnaire was also conducted. Ethical approval for conducting this study has been obtained from the Research Ethics Committee of Faculty of Dentistry Universitas Airlangga (No. 207/KKEPK. FKG/XII/2014). Dental and oral hygiene tests were measured using OHI-simplified, which has two measurement indicators: debris index-simplified (DI-S) and calculus index-simplified (CI-S). Six teeth were examined, i.e., the buccal portion of the teeth 16 and 26 (Maxillary right first molar tooth and maxillary left first molar tooth), lingual portion of the teeth 36 and 46 (Mandibular right first molar tooth and mandibular left first molar), and the labial portion of the teeth 31 and 41 (first mandibular left incisor). The score criteria for DI-S were as follows: 0 (no debris or stain), 1 (soft debris <1/3 cervical crown of tooth), 2 (soft debris >1/3 but <2/3 cervical dental crown), and 3 (soft debris >2/3 cervical dental crown). The DI-S score was obtained by summing up the debris score of each tooth surface divided by the amount of tooth surface examined. As for CI-S, the scores were as follows: 0 (no calculus), 1 (supragingival calculus covers not >1/3 of the tooth surface), 2 (supragingival calculus covers >1/3 but not <2/3 tooth surface and there was subgingival calculus around the cervical portion of the tooth), and 3 (the supragingival calculus covers 2/3 of the tooth surface and the band formation of the subgingival calculus surrounding the cervical portion of the tooth). The individual score was obtained by summing the calculus score of each tooth surface and by the number of tooth surfaces examined. OHI-S score was the amount of DI-S added with CI-S. From this score, it can be determined the degree of oral hygiene with the provisions: good category (0–1.2), medium category (1.3–3), and bad category (3.1–6). The severity of dental caries levels was seen from the number of cavities due to caries, missing teeth due to caries, and dental caries. Data were obtained using DMF-T index. The examination was done by calculating decay score (all of the teeth are hollow or damaged by caries), missing (all missing teeth or indication of retraction due to caries), and filling (all dental caries) on the whole subject then divided by the number of subjects. Of the total of 60 respondents, 25% of patients were cannabis users, 36.67% were users of methamphetamines, and 38.33% were heroin users, with the period of drug use of <10 years as much as 28.33%, between 10 and 20 years as much as 3833%, and >20 years as much as 33.33%. In the survey on dental and oral health, respondents who had received dental health education was 60%, and the remaining 40% had never received dental health education. About 26.67% of respondents used toothbrush to clean teeth, and 73.33% used toothbrush and toothpaste to clean teeth. According to the survey of oral health knowledge, 56.67% of respondents brushed their teeth by rubbing up and down. 16.67% of respondents brushed their teeth in a circular way, 20% brushed teeth sideways, and 6.6% by other methods. 63.34% of respondents chose toothbrush with medium bristle, 23.33% chose toothbrush with soft bristle, and 13.33% chose toothbrush with hard bristle brush. In the respondents' statement about the right time in brushing, the result was 16.67% stated in the afternoon bath, 20% stated in the morning bath, and 53.33% stated after meal and before bed. About 33.33% of respondents stated brushing twice a day, 30% brushing 3 times a day, 16.67% brushing teeth more than 3 times a day, and 20% brushing once a day. About 13.33% of respondents stated that cavities were caused by sweet food, 50% said the cause was poor or bad oral hygiene, 16.67% said the cause was due to maggots, and 20% said they did not know. A survey based on respondents' action if toothache obtained that 40% of respondents own tooth treatment, 36.66% went to health center or dentist, and 16.67% left it alone until it healed itself. From [Table 1], the average value of OHI-S for drug users <10 years was 1.03, whereas those taking drugs for 10–20 years was 2.06 and over 20 years was 2.85. For DMF-T score, <10 years of drug users had an average of 1.5, whereas those taking drugs between 10 and 20 years was 2.6, and those over 20 years was 7.9. From the results of statistical analysis using the Kruskal-wallis test, P < 0.0001 was obtained, which means that there were significant differences between each group. Then the Bonferroni-dunn test was carried out, the difference was obtained for the <10 year drug user group with 10-20 years drug user group at P = 0,0001, <10 years drug user group with drug user group> 20 years P = 0, 0001, and drug user groups 10-20 years with drug user groups> 20 years at P = 0.0312. From the results of the statistical analysis tests that have been conducted, it can be concluded that there are significant differences for each group. In this study, high OHF-S values and DMF-T index were obtained from examination of respondents who had used drugs for more than 20 years, i.e., 2.85 for OHI-S and 7.9 for DMF-T. This figure was quite high, that was, entering into the category of adequate dental and oral hygiene, and the level of caries severity was above average. From the sample group data that had been obtained, it can be seen that the knowledge about dental and oral health of drug users in the Rehabilitation Center of Pondok Pesantren Inabah, Surabaya, was relatively good. As many as 60% of respondents ever received dental health education. In this case, the most important was that the users already had sufficient knowledge about oral and dental health, so it was expected that proper behavior on oral health was performed. In addition, it can also be seen from respondents' answers about how to brush teeth, brushing time, the cause of the hole in the teeth, and the frequency of brushing your teeth with the right answer on average. The average dental and oral hygiene (OHI-S) of respondents was 1.8, while the mean caries severity (DMF-T) was 4.33. 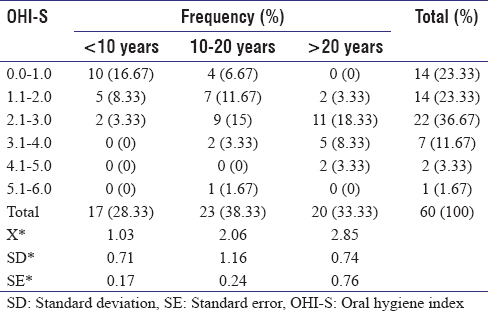 Apparently, when compared with the provision of good OHI-S value of 0.1–1.2, the condition of dental hygiene and mouth of respondents was still not good. The average result of the OHI-S score for drug users <10 years was 1.03, those taking 10–20 years of drugs was 2.06, and those over 20 years was 2.85. Then, for DMF-T, <10 years of drug users had an average DMF-T of 1.5, those taking drugs between 10 and 20 years was 2.6, and those over 20 years was 7.9. This may be due to a considerable time factor affecting dental caries. The longer the remaining food in the mouth is firmly attached to the tooth surface, the easier the occurrence of dental caries. And, prevention and care efforts are to prevent the occurrence of plaque collection or clean it up if it already exists. In addition, drugs that block the nervous system will inhibit the secretion of saliva, water, and electrolyte secretions, and especially those regulated by the parasympathetic nervous system. While almost all narcotic drugs work on the central nervous system. This will also be a supporting factor that affects the caries formation process, given the importance of the role of saliva in the caries formation process. Saliva has a self-cleansing effect and depends on saliva speed and viscosity, and has a buffer capacity that can maintain salivary pH, so that saliva can neutralize acid which is the main cause of dental caries. Overall, the dental and oral hygiene of drug users was quite good with the value of OHI-S of 1.8. The dental caries severity of drug users had a DMF-T index of 4.33. That is, each person on average had 4.3 teeth with caries problems. Sampurno D. Public Health Services. Indonesian Health Magazine. 1986;3:20. Suwelo S. Community Health Services Improvement Program. Semarang: Yana Bakti Publishing; 1992. p. 72. Maramis WF. Study Hygiene Assessment in Health Education. Surabaya: Airlangga University Press; 1986. p. 82-131. Directorate of Mental Health, Ministry of Health of the Republic of Indonesia. Guidelines for Mental Disorders in Indonesia. PPDGJ-III; 1983. Taghi KM, Arghavan T, Maryam A, Pourya B, Elham MG, et al. Drug addiction and oral health; A comparison of hallucinogen and nonhallucinogen drug users. Int J Dent Oral Health 2016;2. Maloney WJ, DD. Addiction and the use of illicit drug use-the oral and dental effects. Biomed J Sci Tech Res 2018;5. Pan SY, Margaret de G, Howard M. A Case-Control Study of Risk Factors for Salivary Gland Cancer in Canada. J Cancer Epidemiol 2017;2017:12. Seyedzadeh Sabounchi S, Torkzaban P, Seyedzadeh Sabounchi S, Ahmadi R. Association of oral health behavior-related factors with periodontal health and oral hygiene. Avicenna J Dent Res 2016;8:e29827. Parmar P, Radha G, Rekha R, Pallavi SK, Nagashree SR. Promoting oral hygiene and health through school. Int J Oral Health Sci 2016;2:70-7. Rasinta T. Dental and Oral Health. Jakarta: EGC; 1989. Tamasa B, Godfrey G, Nelson T, Chen M. Oral health status of children with high risk of sleep-disordered breathing. J Dent Sleep Med 2018;5:31-8. McDonald RE. Dentistry for the Child and Adolescent. 2th ed. Saint Louis: The CV Mosby; 1974. Finn SB. Clinical Pedodontics. 3rd ed. Philadelphia: WR Saunders; 1967. p. 634-55, 681-701. Manson JD. Periodontic. London: Henry Kampton; 1980. p. 65-9. Nolte WA. Oral Microbiology with Basic Microbiology and Immunology. 4th ed. St. Louis: Mosby; 1982. p. 287-9, 304-5, 309-10, 336-8.